It would be a struggle to find a cafe as Parisian as Odette. 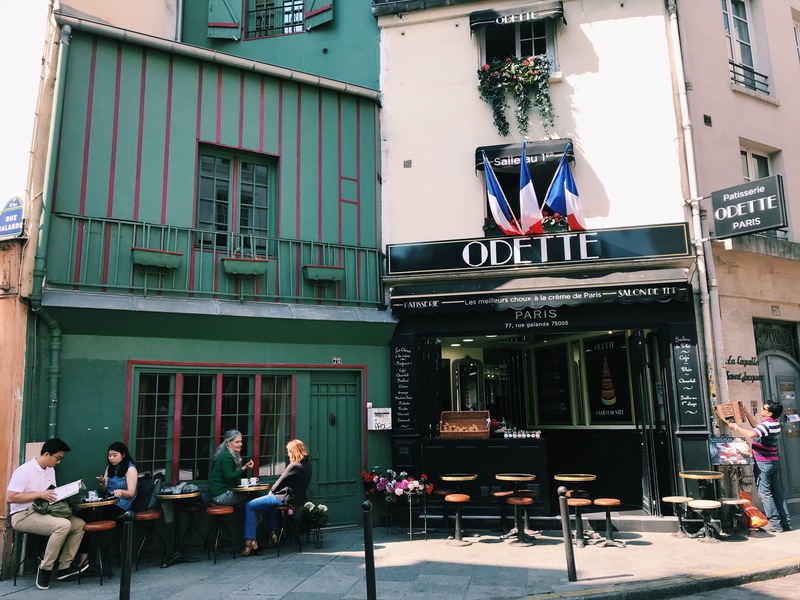 With its colourful exterior, cute little tables and outdoor plants, Odette is as picturesque a cafe that you could ask for. With a selection of coffees and pastries, what Odette is really known for as its delicately decadent cream puffs, the perfect accompaniment to a cafe au lait. This little cafe is located centrally in Paris a few minutes walk from the Notre Dame and the infamous Shakespeare and Company bookshop. It’s address is 77 Rue Galande, 75005, Paris. Be sure to bag a table outside if you can. Odette’s decor is unapologetically girly. Everything from the tiny chairs and tables to its gorgeous little cream puffs, are delicate and beautiful. The patisserie has what has to be one of the prettiest cafe exteriors in Paris. It was the first place that I stopped off at when I arrived in the city in the early morning and I felt like I’d talked right on to a Parisian film set. It’s pretty cosy inside with the best seats being out the front where you can catch a glimpse of the Notre Dame. Odette doesn’t do a lot, food and drink wise, but what it does, it does well. It’s cream puffs or ‘choux a la creme’ are somewhat legendary in the city and they looked so gorgeous with their colourful sugar paste flowers on top that it was a nightmare choosing between them. Unlike a lot of patisserie options, Odettes cream puffs are a ‘two-bite gone’ size meaning that it’s totally acceptable to try a few of them. These gorgeous pastries consist of a light fluffy choux bun exterior which harbours a variety of gooey cream fillings with tempting flavours like coffee, caramel, lemon and pistachio. My favourite has to be the praline one. The only negative is that Odette doesn’t have an extensive coffee menu. Odettes prices aren’t cheap but they’re not outrageous and I didn’t resent paying a little more to sit in somewhere as beautiful as it is. I paid around £6 for a coffee and a cream puff.